Federal authorities sentenced al-Qaida's spokesman to life in prison Tuesday for conspiring to kill Americans through his work with the terrorist organization. The Justice Department announced that Sulaiman Abu Ghayth, a close affiliate and son-in-law of Osama bin Laden, had been sentenced in a Manhattan federal court to spend the rest of his life behind bars. 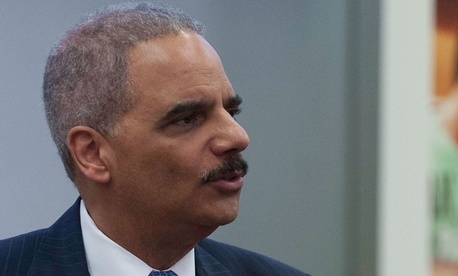 "Justice has been served," Attorney General Eric Holder said in a statement. "This outcome ensures that Sulaiman Abu Ghayth, a senior member of al-Qaida and an associate of Osama bin Laden, will never again set foot outside a prison cell." U.S. attorney Preet Bharara called Abu Ghayth, 48, "the mouthpiece of murder and menace" for al-Qaida. Abu Ghayth's work with al-Qaida occurred mostly in 2001 and 2002, when he was tasked with propagating bin Laden's terrorist objectives and recruiting young men to join the terrorist network. The Justice Department highlighted a video of Abu Ghayth appearing alongside bin Laden and Ayman al-Zawahiri the day after the Sept. 11, 2001, terrorist attacks in which he gave a speech that warned the U.S. and its allies that "a great army is gathering against you." The speech also called on "the nation of Islam" to wage war against "the Jews, the Christians, and the Americans." Abu Ghayth was smuggled from Afghanistan to Iran in 2002, where he was later arrested with a number of other al-Qaida leaders. He was convicted in March on conspiracy to kill Americans, providing material support to known terrorists and conspiracy to provide support. Abu Ghayth's defense team sought 15 years in prison, resting largely on the premise that he was being convicted not for actions but for his words. Judge Lewis Kaplan ultimately disagreed.